Eva’s Village, a Paterson, NJ, anti-poverty non-profit organization, hosted the 13th Annual L. Robert Keller Memorial Invitational Golf Tournament on June 27. Funds raised support twenty integrated programs that provide food, shelter, medical care, recovery and support services to those in need. 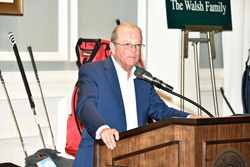 Eva's Village Board Member D. Peter Keller addresses guests at the L. Robert Keller Memorial Invitational Golf Tournament on June 27 at Canoe Brook Country Club, Summit, NJ. “Funds raised at the golf outing and other events each year, provide critical support for the food, shelter, medical care and supportive recovery services we offer for the greater Paterson Community,” noted Eva’s Development Director Heather Thompson. Eva’s Village 13th Annual L. Robert Keller Memorial Invitational Golf Tournament on June 27 raised $306,179, representing a seven percent increase over funds raised at last year’s event. Over 220 guests turned out for the day-long event to test their skills on two, historic, 18-hole courses at Canoe Brook Country Club in Summit, NJ. Perfect summer weather greeted the golfers, who were treated to a lunch buffet and gathered later for cocktails, a silent auction, and a seated awards dinner in the newly renovated clubhouse. Eva's Village Board Member D. Peter Keller, owner of The Madison Hotel in Morristown, NJ and event chair, established the tournament in memory of his brother, L. Robert Keller. “Our family is humbled to support the work of Eva’s Village on behalf of men, women and children in need,” said Peter. “Funds raised at the golf outing and other events each year, provide critical support for the food, shelter, medical care and supportive recovery services we offer for the greater Paterson Community,” noted Eva’s Development Director Heather Thompson. “Eva’s Village depends on private donations and fundraising, which make up more than a third of our annual revenue,” she said. The rest of the money raised at the event will help fund several Eva’s Village programs that rely entirely on private donations, including Eva’s Community Kitchen, its free medical and dental services, and the childcare and education programs for the children living in Eva’s facilities. Last year, Eva’s served over 330,000 meals to guests in our Community Kitchen and to those in our residential programs, provided shelter and housing to nearly 500 adults and over 100 children, helped nearly 2,500 individuals find a path to recovery through our substance abuse treatment and mental health programs, and had over 5,300 patient visits to the Medical & Dental Clinic. During the awards dinner, guests contributed more than $12,000 to underwrite the cost of Eva’s Summer Program, attended by the school-aged children who live at Eva’s Village. Activities include swimming and horseback riding lessons, dance and art classes, a week at HealthBarn USA, and an end-of-summer carnival. This program does more than entertain kids, noted Clarisa Mercado, Eva’s Childcare & Education Department Shift Leader. “Trying new experiences helps kids learn to be more receptive and aware of others. We use this opportunity to teach them about compassion and giving back,” she said. Founded in1982 by Msgr. Vincent E. Puma, Eva’s Community Kitchen began by serving 30 meals a day in Paterson to feed the hungry. In response to the related issues of poverty, addiction, mental illness and homelessness in the community, additional programs and services grew out of the Community Kitchen to become Eva’s Village, a non-profit, social service, anti-poverty organization that is one of the most comprehensive in New Jersey. For more than 30 years, Eva’s Village carried out its mission to feed the hungry, shelter the homeless, treat the addicted, and provide medical and dental care to the poor with respect for the human dignity of each individual. Today, Eva’s Village helps thousands of individuals rebuild their lives each year through 20 integrated programs addressing needs in the community for food and housing, medical and recovery services, and education & training programs. 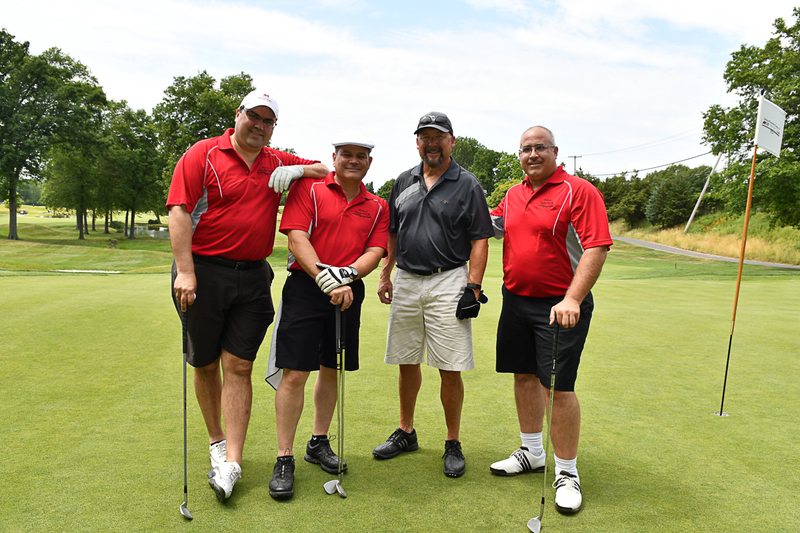 Railroad Construction Company, Inc.'s foursome at the L. Robert Keller Memorial Invitational Golf Tournament, Canoe Brook Country Club, Summit, NJ., golfing to raise funds to benefit Eva's Village. Eva's Village mission is to feed the hungry, shelter the homeless, treat the addicted and provide medical and dental care to the poor with respect for the human dignity of each individual.